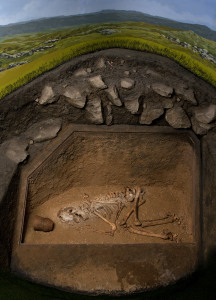 The Museum’s reconstruction of an early Bronze Age burial at Liffs Low, Hartington – a young man of 25 to 30 years old who at some point had broken his elbow. Near him were a stone pendant and a decorated beaker. The new gallery gives us a fantastic chance to think about the stories of the people of the Peak District, from early people to the modern day. When archaeological digs are carried out, after all the analysis has taken place, any human remains and associated objects and records are often homed in the local museum where possible. They are a physical link to the folk who left their mark in the landscape. Some had their homes here, some were just passing through. Their structures, tools and artefacts can show us their skill, technology and humanity. traces of them have somehow carried on into our modern lives. 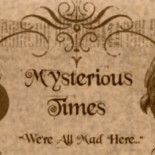 What fascinates you about earlier people in this area? This entry was posted on February 13, 2016 by Kirst Mason D'Raven in Uncategorized.